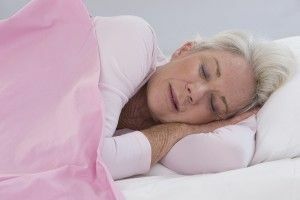 As we age, we experience many physical changes from needing reading glasses for the morning newspaper to being less able to tolerate spicy food, but there is one significant change that can truly affect your personal well-being and happiness – sleep. It is normal that our sleep patterns change as we advance in years. But chronic insomnia, lack of energy, and an unshakable feeling of fatigue can have a real impact on your quality of life. Older adults may experience periods of insomnia. This is normal and can happen from time to time. But chronic insomnia that persists over a series of nights should warrant a visit to your medical provider. There may be a medical reason why you or someone you love is not getting a restful sleep. Sleep Apnea. Loud snoring can be a symptom of Obstructive Sleep Apnea (OSA). OSA can cause significant health issues, including high blood pressure if left untreated. OSA causes your breathing to stop as you sleep. When the oxygen drops in your blood, your brain is alerted to awaken and resume breathing. This can repeatedly happen during the night, causing multiple interruptions in your sleep and leaving you fatigued in the morning. Not only does OSA disrupt your sleep, but it can also put you at risk for cardiovascular disease, depression, and memory loss. Gastroesophageal Reflux Disease (GERD), also known as acid reflux. The discomfort and pain caused by GERD can make it difficult to fall to sleep or to sleep soundly. GERD is a backflow of acid in the esophagus that can cause heartburn, coughing, and choking when laying down. If you are experiencing these symptoms, consult with your physician. Restless Leg Syndrome (RLS) and Periodic Limbs Movements of Sleep (PLMS). These neurological disorders are characterized by unpleasant tingling, creeping, or pulling feelings, typically on the legs that cause an urge to move your limbs when you are at rest. Pain can happen as we age for a number of reasons – lower back pain, arthritis, headaches, surgery, or illness. This can disrupt how long it takes you to fall to asleep and remain soundly asleep. Heart Disease. Sometimes the symptoms of heart disease can cause poor sleep, such as angina, fluid buildup in the lungs, or abnormal heart rhythm. Sleep issues can be a sign of greater issues in your health. These symptoms should not be ignored. Frequent Urination. Frequent need to visit the bathroom during the night or incontinence can disrupt your sleep pattern and leave you wide awake. This can be a sign of diabetes, a side effect of medication, a urinary tract infection, or a kidney infection. This should be discussed with your doctor. Alzheimer’s and other forms of Dementia. Researchers do not completely understand why Alzheimer’s and other forms of dementia disrupt the sleep patterns of patients. Along with the changes in memory and physical changes, sleep patterns will also change. Sundowning can also be an issue causing agitation during the evening hours, making it difficult to settle down and relax before a bedtime routine. We all know that a full night of restful sleep is important for your health and well-being. If you or your loved one are experiencing issues that affect your nightly sleep, consult with a medical professional. You can also find tips on how to create a routine and what to avoid before sleep to aid your slumber at the National Sleep Foundation.